Chris and I recently had the opportunity to meet David van Velden; owner and wine maker of Overgaauw wines with a small group at a private party; and again the following day at a wine dinner in a local wine bistro shop in Otsego, Minnesota. We were able to sample five of Davids wines and we were quite impressed! Before this experience, I have tried and rated around six or so other South African wines and they have been really great for the price. I consider South African wines a real value! I intend to learn more about South Africa wines in general and have decided that I would educate myself so I can make wiser wine purchases. I’ll share some of my findings! The rand is the currency of South Africa. The rand has the symbol “R” and is subdivided into 100 cents. The “Cents” was introduced on 14 February 1961. A Decimal Coinage Commission was set up in 1956 to consider a move away from the denominations of pounds, shillings and pence, submitting its recommendation on 8 August 1958. It replaced the South African pound as legal tender, at the rate of 2 rand = 1 pound or 10 shillings to the rand. 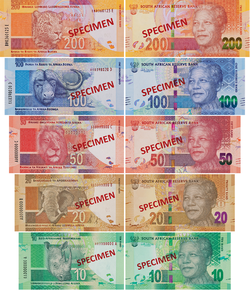 There have been five issues since 1961 and the most recent banknote (issue number five) include pictures of Nelson Mandela’s image. The reverse side captures images of Rhinoceros (10 rand), Elephant (20 rand), Lion (50 rand), Cape Buffalo (100 rand), and Leopard (200 rand). The average conversion from Rand to US dollar is: 1 Rand equals $10 dollars US. Wine grapes have been grown in South Africa longer than any of the other new world areas (South America, Australia, United States). It was settled in the 1600’s by French, Dutch and English settlers. They came to the southern tip of Africa because of its strategic location. When we look at wine in South Africa, we see that there’s a fairly large production, about 10 million hectoliters. This places it 8th in worldwide production, which is actually quite high considering the small population in South Africa. However, despite this large production, very little of that wine is actually consumed in South Africa. Most of it is exported, great for us! The region has very diverse soils and a broad range of ecosystems. So we’ll have cool regions which produce low yielding, high quality grapes for making expensive wine and then we’ll have large inland areas that have warm climate, much as we do in California in our San Joaquin Valley, for producing lower cost wine. But as a result of the small domestic market, the South African wine industry is extremely dependent on exports. Most of that goes to the U.K., Japan and Ireland (with China growing fast). I do see some South African wine in my local liquor stores, and the importing of that wine seems to be growing. I believe that if people were informed about the value and quality of these wines, they would be more intrigued to try some. Now in parallel with many other regions of the world, wine growing practices in South Africa have changed much of late. In the established older systems, they were developed to encourage very high yields but resulted in relatively low quality wine. Much of the wine was actually distilled to make brandy because distillation was fairly profitable. However, today we see a dramatic increase in small, high quality wine producers and they largely grow the traditional international varieties such as Cabernet, Chardonnay, Merlot and Sauvignon Blanc. South Africa is known for a number of particular grapes and Pinotage is certainly the distinctive South African grape. It was produced by a breeding program in South Africa in 1925 in the gardens of scientist Abraham Perold. It was a result of crossing Pinot Noir and Cinsault. 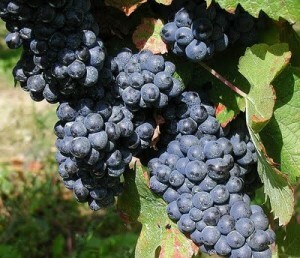 Cinsault is a Rhone variety and at the time in South Africa, that variety was called Hermitage. Hermitage is a name of an important town in the Rhone Valley of Southern France. The resulting cross, Pinotage, is a red grape and it has moderate tannin but it also has a very distinctive and strong fruity aroma many people refer to it as a banana aroma. Because of this particularly distinctive aroma, it has never really gained a very large market share and it only has a few percent of total production in South Africa. However, it is distinctive and in many ways it is the flagship red grape for South Africa. Most of the Pinotage I have tried have smokey notes. I am told this is not a characteristic of a well-balanced Pinotage. 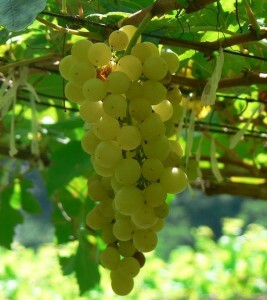 Another varietal South Africa produces is a large quantity of Chenin Blanc. This is a grape variety that comes from the Loire region of France. In South Africa, Chenin blanc is largely known as Steen. You may see it labeled this way on wine bottles. It is very widely used for producing moderate quality white wines. However, small amounts are used to make very high quality white wine and you can find excellent examples of Chenin blanc, comparable to the quality from the Loire area. I tried one recently and enjoyed it. Click the link to read more about the Jean Daneel Signature Chenin Blanc. The South African wine industry has a long history of fortified wine production producing wines known formally as “Cape port” (though the term “Port” is protected in the European Union to refer to only the wines from the Douro region of Portugal). These wines are made from a variety of grapes, such as Shiraz and Pinotage, as well as Portuguese varieties like Tinta Barroca, Touriga Nacional, Souzão and Fernão Pires. The minimum alcohol level for these wines must be 16.5–22%. The many styles of “Cape port” closely parallel their Portuguese counterparts. 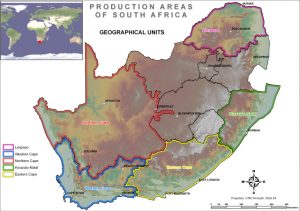 The wine regions of South Africa were defined under the “Wine of Origin” act of 1973. Mirroring the French Appellation d’origine contrôlée (AOC) system, all South African wine labels listing a “Wine of Origin” must be composed entirely of grapes from its region. 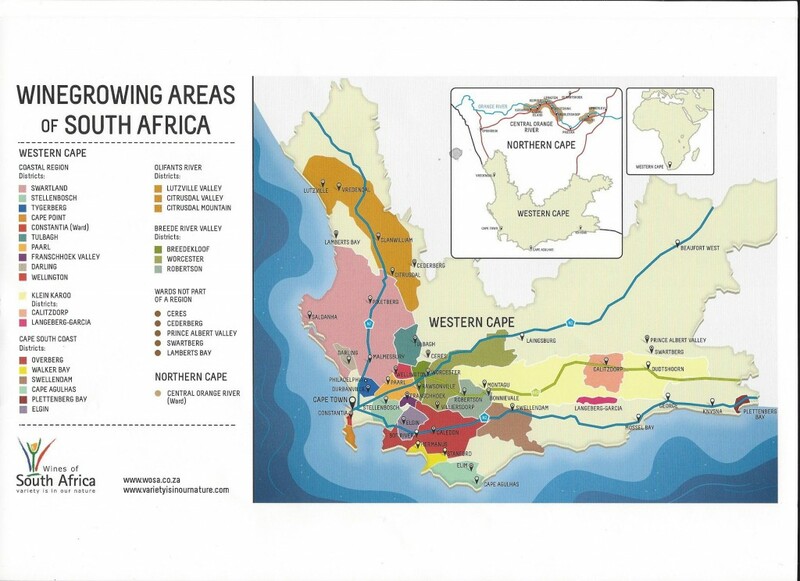 The “Wine of Origins” program mandates how wine regions of South Africa are defined and can appear on wine labels. While some aspects of the Wine of Origins are taken from the AOC, the Wines of Origin is primarily concerned with accuracy in labeling (like the US labeling laws). As a result, the Wine of Origin does not place adjunct regulations on wine regions such as delineating permitted varieties, trellising methods, irrigation techniques, and crop yields. The Wine of Origin system divides growing regions into five graphical units (like California, Washington, Oregon). The first and largest is Western Cape followed by Northern Cape, Eastern Cape, Kwazulu-Natal, finally Limpopo. Within each Graphical units are Districts, Regions, and Wards. Districts have to meet the same criteria as wards but with a broader definition of the relevant area using macro geographical characteristics such as mountains and rivers. Naturally, a greater variety of soil types are allowed than in the wards. This would be a unit larger than a region and containing several regions such as Overberg contains Walker Bay, Bot River etc. Regions are mainly defined according to the encompassing area name which in the case of a river stretches from the source to the mouth thereof. When it comes to an estate, which can consist of one or more farms, it has to be accepted that the natural factors can differ but it is distinctive because in most cases there is only one producer and the farms are run as a unit. Like Napa Valley, Sonoma, Paso Robles, etc. South African wine people would not consider any other region than the Western Cape as quality producing regions. Most others are too small to be serious contenders. You could think of this like Napa AVA’s (Oakville, Stags Leap, Rutherford, etc). A Ward is defined, soil, climate and ecological factors play a very important role as they have a clear influence on the character of the wine. The proposed area name also has to be the real geographical place-name and nature has to dictate that the specific area can actually produce wines with a distinctive character. 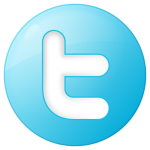 A ward is usually a smaller specifically defined area within a region eg Sondagskloof is a ward within the Walker Bay region. For the most part the South African label laws are similar to the France and US. South African labeling law focus largely on geographical origins, falling under the purview of the “Wine of Origin” legislation. A Single vineyard designated wine can be produced, provided that the vineyard is registered with the government and all the grapes used in the production of the wine was grown in that vineyard. The term “Estate” no longer qualifies as a designation of geographic origins, wineries can still label “Estate wines” provided that all the grapes were grown and the wine vinified and bottled on the same property. The South African Wine and Spirit Board operates a voluntary program that allows South African wines to be “certified” for quality and accuracy in labeling. Under this certification process, vintage dated wine must be composed of at least 85% grapes that were harvested that vintage year. Varietal wines must also be composed of at least 85% of the listed varietal. Blends, such as a Cabernet Sauvignon and Pinotage blend, can have both varietals listed on the label provided that the two wines were vinified separately. A wine that has been “co-fermented”, with both grapes crushed and vinified together such as a Shiraz-Viognier, cannot list both varietals. I spent many hours reading and searching the Internet. Fortunately, I have a friend named Roy who is from South Africa in the wine business that I am able to ask questions. Now that we’ve reviewed some facts, it is time for the fun stuff – drinking more wines from South Africa. Look and shop for these terrific wines that are found at great values. Ask for them at your local liquor store and try them. What I have noticed so far are primarily wines from Stellenbosch, Paarl that have all been home runs. For white wines; I prefer the South African Chardonnay and Chenin Blanc; and for Reds I’ve enjoyed Rose’s, Cabernet Sauvignon, and various Cabernet Merlot blends. I need to try more Pinotage. We recently consumed a 1998 and 1994 Overgauux Cape Vintage port, which were both excellent!